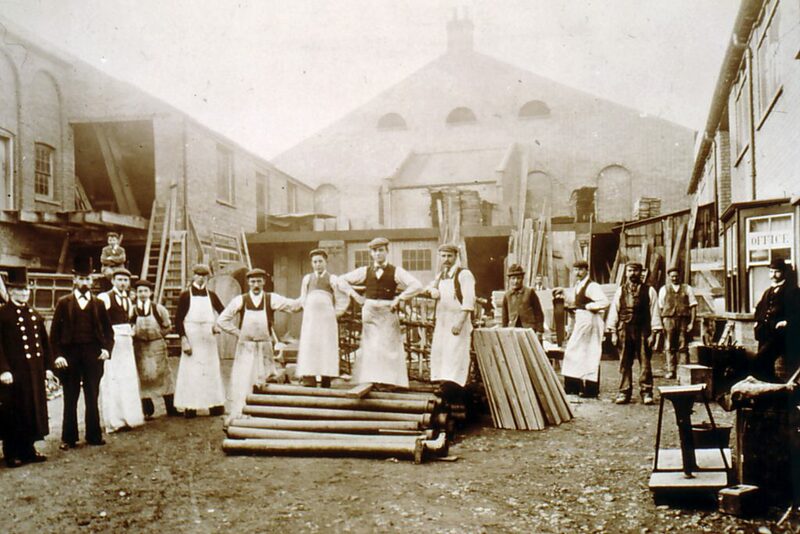 In 1875 Thomas and Edward Neville, two brothers who had trained as joiners, started working for themselves as T & E Neville as builders, joiners and undertakers. At the turn of the century, Stanley Henman, whose knowledge and skill contributed a great deal to the growing company. In 1906 Stanley Henman married Thomas Neville’s daughter, Clara. They had two sons, Stanley, who would take no active role in the business and Bernard, born in 1910. 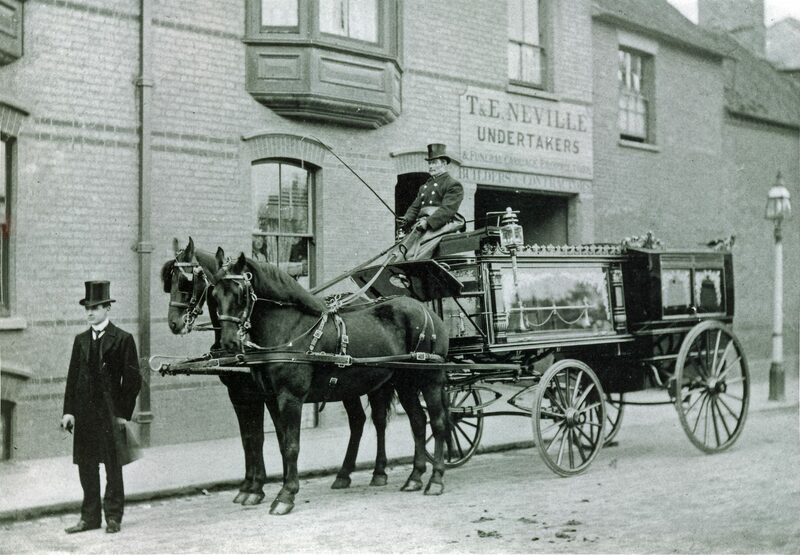 In 1909 the first member of the second generation of the Neville family joined the business with the arrival of Tom Neville’s son, Tom junior, who took over the running of the funeral business until his premature death in 1930. By the early part of the 20th Century additional premises had been found to accommodate the funeral side of the business and the ‘fleet’ increased to twelve black Belgian horses, two glass sided hearses and four Shellabiers. Following Tom junior’s untimely death his son, also named Tom, took some interest in the business, joining in 1932. The new manager of the funeral business was old Tom Neville’s nephew, Ernest Wood. His father William had worked for the firm, his brother Bert, was employed as a carpenter and joiner, and his elder son, Stuart, joined the firm in 1938, later followed by Stuart’s brother, Hugh, both of who would also work for the funeral service. By 1948 the last of the Belgian Blacks were retired to grass at John Neville’s farm and Rolls Royce funeral cars and hearses were purchased to replace them. The fourth generation of the family entered into the business when Michael Henman began work in 1950 at the age of 16 and Peter in 1953 at the age of 15. In 1953, in anticipation of the redevelopment of Luton Town Centre, the shareholders purchased Common Farm, in Leagrave on the outskirts of the town. The funeral service part of the business was the first to relocate from central Luton to Leagrave in 1967. 1n 1976 Neville’s purchased the building and undertaking firm of George Squires and Sons of Shefford. In 1979 Peter Aspinall, who was manager of the business, was appointed managing director, retiring in 2012. Following Bernard Henman’s death in 1985 a new company, Neville Funeral Service Limited, was formed. Until that time it had always been part of T & E Neville Ltd. Expansion continued with the purchase of Peacock’s former memorial masonry yard in Shefford. A redundant church in Ampthill was purchased and repurposed to a funeral home incorporating the newly formed flower service run by Peter Aspinall’s wife, Denise. Michael Liddle, our current managing director, joined the business in 1989 and in 1990 the business purchased Arnolds Funeral Service in Bedford to enable the proprietor to retire. Further branches have been added in Hemel Hempstead and Hitchin as well as the memorial business of Garlick Bros in Bedford. In 2019 all of the final locations were all bought under the name of Neville Funerals. Family continuity and commitment remains strong, as members of the fourth and fifth generation are still actively involved in the running of the business. Many of the original family and business documents and records have been loaned to the Bedford County Archive so that the history of the business can be shared within the wider local community. A history of the company has been published ‘Building the Name – Neville’ The Story of a Family Business 1875 – 2000, if you are interested in a copy, please contact our head office and ask for Vicky Trumper.